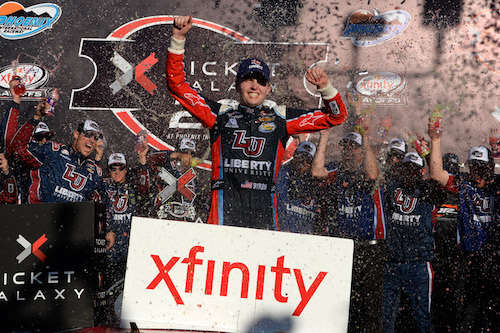 William Byron celebrates in victory lane at Phoenix International Raceway after winning the Ticket Galaxy 200 on Nov. 11, 2017 (photo courtesy of Getty Images for NASCAR). William Byron won the Ticket Galaxy 200 NASCAR Xfinity Series race at Phoenix International Raceway on Saturday, cementing his advancement to the 2017 playoff Championship Four, scheduled for Nov. 18 at Homestead-Miami Speedway. Byron will be joined in the final four by JR Motorsports teammates Elliott Sadler and Justin Allgaier and Daniel Hemric. Eliminated from the playoffs at Phoenix’s checkered flag were Brennan Poole, Matt Tifft, Cole Custer and Ryan Reed. Poole entered the race in the provisional final playoff advancement spot behind the JRM trio, but his retirement from the race as the result of an early-race wreck with Caesar Bacarella ended his championship efforts. Hemric, meanwhile, headed into Phoenix seventh in points among the eight remaining playoff drivers, but gained enough ground to advance by finishing highest among the playoff drivers in each of the two 60-lap stages and finished the race fifth. Meanwhile, Monster Energy NASCAR Cup Series driver Ryan Blaney dominated the race, winning both stages while leading 147 laps of the 200-lap race. The race saw only three lap leaders — Blaney, pole sitter Erik Jones and eventual race winner Byron. Before Byron took his one and only lead with a two-tire pit stop during a caution in the final 20 laps, the entire race, to that point, had been led by Jones and Byron. After starting on the pole, Jones led the first 33 laps before he was first passed by Blaney for the lead. He and Blaney, then, traded the lead back and forth for a few laps before Blaney took command of the race on lap 38. Blaney, then, led until Byron took the lead with his two-tire strategy. Blaney restarted the race in the fourth position with four new tires after the fifth and final caution of the race. He got back up to second to take runner-up honors. Erik Jones finished third after sliding through his pit box and losing a few positions on pit road during the final yellow. Other top-10 finishers included Blake Koch in sixth, Custer in seventh, Alex Bowman eighth, Austin Dillon in ninth and Justin Allgaier 10th.